The North Wessex Downs are an Area of Outstanding Natural Beauty located in the counties of West Berkshire, Hampshire, Oxfordshire and Wiltshire. The name North Wessex Downs is better known by various overlapping local names such as the Berkshire Downs, the North Hampshire Downs, the White Horse Hills, the Lambourn Downs, the Marlborough Downs, the Vale of Pewsey and Savernake Forest. The North Wessex Downs covering an area of 668 miles is the third largest of Britain’s 46 Areas of Outstanding Natural Beauty. The area united by chalk is made up of remote rolling downland to charming market towns and picture postcard villages, topped by rampant white horses, dramatic scarp slopes, majestic ancient woodland and sheltered valleys with sparkling rivers and streams. The Downs are also packed with wildlife, grassland grazers, rare butterflies, chalk-loving flowers, history, romance and bustling business. Horse racing is a major industry in the Downs because of the good quality turf that comes with the underlying chalk. The majority of the upland area is made over to gallops and other training areas. Many upland villages, especially the large village of Lambourn, are home to major racing stables. White Horse Hill is designated a Site of Special Scientific Interest due to its Pleistocene sediments and has one of the few remaining unploughed grasslands along the chalk escarpments in Oxfordshire. The Uffington White Horse dating from the Iron Age or late Bronze Age is one of best known archaeological sites in the UK. The horse from head to tail is a 360 feet (110 metres) long hill figure formed from deep trenches cut out of the turf and filled with crushed white chalk on White Horse Hill high up on the Lambourn Downs, across the Oxfordshire border. It lies about a 1½ miles south of the village of Uffington and just south of the village of Woolstone. 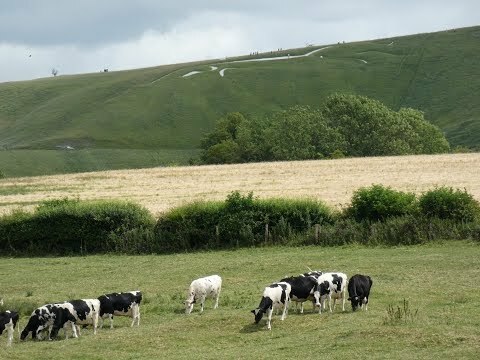 It is the most famous of eight huge hill figures contained within the North Wessex Downs and was probably carved around 1000 BC making it the oldest surviving hill figure in Britain and making it close to 3000 years older than the Wiltshire horses. It is thought to have been a religious totem of some kind, associated with the people who were later called the Atrebates. The Uffington White Horse was a direct influence on much later figures of white horses such as Kilburn White Horse in Yorkshire and Folkestone White Horse in Kent and was also the inspiration for many more figures around the world. The site is owned and managed by the National Trust and is a Scheduled Ancient Monument. The horse quickly becomes obscure if not cleaned regularly and has always needed frequent work to keep it visible. Today periodic scouring is done on chalk days, organised by the National Trust, where volunteers with hammers, buckets of chalk and kneepads kneel and smash the chalk to paste, whitening the paths cut in the grass inch by inch. During the Second World War the horse easily recognised from the air was covered over by turf and hedge trimmings so that Luftwaffe pilots could not use it for navigation during bombing raids. The best views of the horse, which can be seen from 35 miles away, are obtained from the air or from the B4508 road to the north or from directly across the Vale, particularly around the villages of Great Coxwell, Longcot and Fernham. Dragon Hill is a round natural chalk hillock about 10 metres high with an artificial flat top. Situated below the White Horse it is associated in legend with St George and the Dragon. Dragon Hill with the Uffington Horse in the background was used as a setting for the music video of the Kate Bush song Cloudbusting. Uffington Castle, an Iron Age hill fort, overlying a Bronze Age predecessor, is located above the White Horse on the summit of White Horse Hill. There are also a number of associated burial mounds and there are others further south. Uffington Castle is a large enclosure of about 220 metres by 160 metres surrounded by a wide chalk stone bank or inner rampart about 12 metres wide and 2.5 metres high and formerly lined with sandstone. Around this is a grass covered ditch about 3 metres deep and a further smaller bank forming an outer rampart. A causeway flanked by the out turned ends of the inner rampart provided an entrance to the site from the west this would have been closed by a gate. The Iron Age buildings would probably have been large round huts each housing a large family group. Large Iron Age hill forts are rare and most are situated on the high chalklands of the southern counties of England and Uffington Castle is regarded as an outstanding example. The Ridgeway passes just south of the hill fort and also passes the fort on top of Ram’s Hill which seems to have been a Bronze Age cattle ranching and trading centre. Woolstone is a long village situated at the foot of the Berkshire Downs in the Vale of the White Horse. The village houses a pub the White Horse Inn and All Saints Church. Just south of the village is Woolstone Wells which are a group of springs in the chalk escarpment. A stream flows north from the springs past the village of Uffington and joins the River Ock about 2 miles north of Woolstone. The village of Uffington, also at the foot of the Berkshire Downs, is situated in the middle of the Vale of the White Horse also known as the Ock Valley. Uffington is most commonly known as the location of the Uffington White Horse. The village about a mile northeast of Woolstone is surrounded by farms and consists of thatched chalk block houses, a pub the Fox and Hounds and St Mary’s parish church which is known as “The Cathedral of the Vale” is a Grade I listed building. Uffington parish like most parishes in the Vale is long and thin, running north south so that it includes both low-lying arable land and grazing upland on the Berkshire Downs. The old Wilts & Berks Canal that passes north of the village was built late in the British canal boom and completed in 1810. Competing with the Kennet and Avon Canal and Great Western Railway the Wilts and Berks Canal was never very profitable and was abandoned in 1914. Woolstone and Uffington were part of Berkshire until the 1974 boundary changes transferred them to Oxfordshire. From the bottom of the car park we turn right through the gate and head forward following the faint path with the fence on our left until we reach the view point and information board. We now bear right uphill to a track and turn left. We go through a gate and cross straight over the road to take the bridleway opposite. At the footpath sign we turn left towards the White Horse. We walk across the top of the White Horse and keep heading forwards slightly downhill. At the hedge line we turn left downhill. At the road we cross straight over onto Dragon Hill and then make our way back down to the road again. At the road we turn left and continue forward. We cross straight over at the crossroads towards Uffington. After passing Sower Hill Farm, livery stables, we keep ahead for a short way then turn left at the public footpath sign. We head forward with the hedge on our right. In the next two fields we keep heading forward until we reach the road. We now turn left into the village of Woolstone and bear right at the White Horse Inn. When the road turns sharp right we head forward onto the gravel path. We cross over a stile and continue over two fields to a track at the other side of the hedge. We cross the track to pass over a footbridge then bear slightly left to cross over a stile. We then turn right with the fence on our right and continue forward until we meet the road. We cross straight over to take the bridleway opposite. We soon come to another road and turn immediate left uphill. At the cross roads we cross straight over still going uphill. The road levels out for a while before we reach a track, the Ridgeway. We turn left here and follow the Ridgeway slightly downhill then at the crossroads we continuing ahead uphill. Close to the top of the hill we turn left over a stile and make our way up to Uffington Castle. At the top we turn right and follow the ridge passing a trig point. When we reach the National Trust Uffington Castle sign we turn right down into the ditch back up the other side and turn immediate left. We now follow the path downhill to the road and go through the gate opposite. We now just follow the well defined path across the field back to the car park. This is a moderate walk on grass and gravel paths and tracks. There are some sections of minor tarmac road and some inclines and declines. Approx 6 miles allow 2½ – 3½ hours using OS Explorer Map 170, Abingdon, Wantage and Vale of White Horse. This walk is done anti-clockwise. Start Point: White Horse Hill car park. The Uffington White Horse and Uffington Castle are on the Lambourn Downs, Oxfordshire. From the A420 between Swindon and Oxford take the small road south to Fernham and Uffington. From Uffington continue south to meet the B4507. Cross straight over the B4507 onto the narrow road and continue up Dragonhill Road until you reach Woolstone Hill Car Park on the right. Parking: White Horse Hill Car Park. Pay and Display £4 for all day. There are no public toilets. For refreshments on-route there is the White Horse Inn at Woolstone. There is also the Fox and Hounds at Uffington and the Blowing Stone at nearby Kingston Lisle.